Here at Force, we value safety above all else, and we know that it’s a priority to our customers, too. 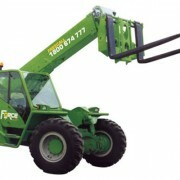 Telehandlers are used in a variety of fields and for many purposes, from home construction to mining. Some general precautions should be applied in every situation to ensure safe handling. The following rules are simple, but will assure everyone near a job site that involves a telehandler is kept safe. This one is a no-brainer, but it’s so important we’re going to tell you about it anyway. Not all telehandlers are created equal. Some have been designed for use on rough terrain, but not all. The design of the machine will affect how it’s operated, and it’s essential that you receive training specific to your situation. In addition, there are operational differences dependent on the attachment at the end of the boom. A telehandler outfitted with a crane jib requires different training than a wood grab. It’s so important that operators receive proper training that it’s part of the Occupational Health and Safety Act. This law states employers must ensure that employees receive proper training. What’s more, employers are obligated to keep records of the training, so only verifiable, professional training is accepted. Working safely with telehandlers means looking beyond the machine itself. You have to assess the whole operating environment to identify potential hazards. These might be both on the ground and overhead. Clearing the space around where a telehandler will be used is critical to operating safely. While you are free to make your own judgment calls about overhead hazards, you should always keep at least three metres away from electric lines. You might want to consider doubling that distance if you are working with bulky materials, such as metal pipes. We’re in the telehandler hire business, but that’s not why we’re including this safety tip. The truth is, when it comes to operating this equipment safely, you have to accept that man is not smarter than the machine. Never override any safety mechanisms, whether the handler is hydraulic or electrical. The load limit must be respected at all times. And only use the telehandler in the way it’s intended to be used—it’s NOT okay to try and do double duty with a handler intended for indoor use at your outdoor site. Hire an appropriate model instead. The fact of the matter is that the operator’s manual for the specific piece of equipment you are using should always be followed, even if it goes against how you’ve done things in the past. Telehandlers are great pieces of equipment—very useful indeed—but they can be hazardous if used improperly. Make sure that everyone involved has the proper training, follow the guidelines for the specific piece of equipment you’re using, and rest easy knowing your operators are safe, along with everyone else on your job site.